A hundred years ago this week… A significant historic moment – Foreign Secretary Arthur Balfour’s “Declaration” that the British Government recognised the Jewish people’s right to establish a state in Palestine – may have escaped general attention given its release while the 2nd Battle Of Passchendaele proceeded (October 26-November 10). The Canadians launched the second phase (30) and reached their objectives – farms rather than villages – very quickly, but then paused to consolidate as per strategy and because of the price they’d paid despite their success (Canadian casualties 2,321, German unknown). That same day, the British attacked along a line from Ypres to Passchendaele, and reached the latter, but were then driven back. Further south on the Western Front, the French concluded the Battle Of Malmaison (Oct 23-November 1) with a night attack (1/2) which the Germans retreated from so subtly that the following morning the French soon realised they were bombarding empty trenches on the Chemins Des Dames. They moved on to take Cerny, Ailes, and Cortecon, while the Germans regrouped across the river Ailette (still in the Aisnes region). On the Eastern Front, the previously dominant German Army had a second oddly ineffective week – possibly hesitating because of volatile political developments in Russia – as the Russian Army repulsed their attempted advance near Riga, Latvia, from Janinzen to Skuli (October 29). Meanwhile, the Italian Army, in full retreat during the early stages of the 12th Battle Of The Isonzo (October 24-November 19) made a stand on the south bank of the River Tagliamento, assisted by the pursuing Austrians/Germans hitting a problem with their supply lines after moving so fast. In Gaza, combined British/Anzac/Indian/French and Italian forces broke the six-month stalemate in the region with a combination of attacks on the Turkish defensive line from Gaza to Beersheeba. Immediate success followed at Beersheeba (October 31-November 7) and Gaza (November 1-2) – although the whole city didn’t fall – but the Turks held off the Allies in the Battle of Tel el Khuweilfe (November 1-6). 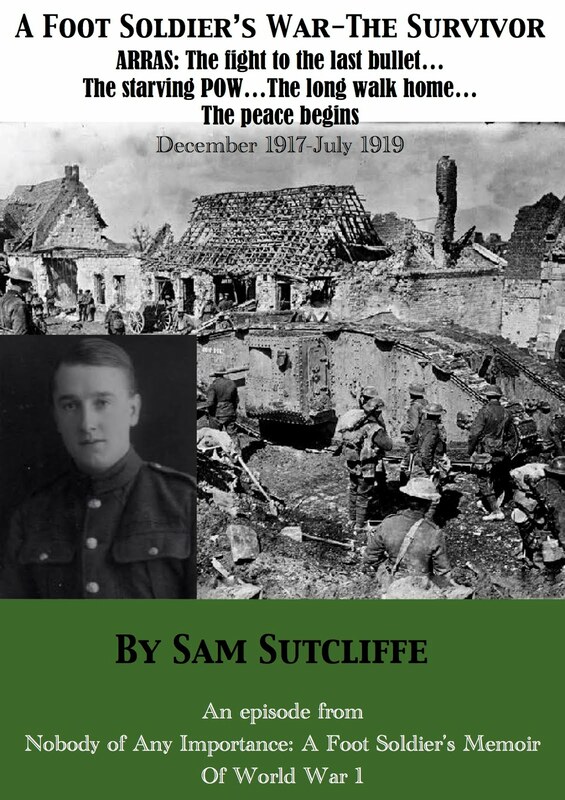 Last week, my father, then Corporal/Acting Sergeant Sam Sutcliffe, survived the first day of the Battle Of The Somme, July 1, 1916, in the Hébuterne/Gommecourt sector on the northern end of the Front. His Company mainly trapped in an advanced trench by the storm of artillery and machine-gun fire, like many others he simply endured while comrades were wounded, buried, blown apart and the British trench system collapsed into shapeless rows of ditches. In particular he saw strong men lose their minds, at least temporarily, and shared the stunned inertia which afflicted everyone by the end of the day – “nervous shock”, he termed it, though today it would certainly be called Post Traumatic Stress. During the subsequent nights, the remnants of his Battalion, the Kensingtons (59 per cent casualties the official figure, “normal” for that day), went out into No Man’s Land retrieving the wounded and the dead – and restoring their own morale a little by doing something useful, though appalling. ‘The stench of war was really beginning to get up my nose. I liked no part of it. With six of my men, I dossed in a room in part of a house just behind the trenches(1). Little peace to be had there, mostly because of some geographical freak. All the bits of buildings, bits of trees, humps of earth and what have you between my boudoir and some misbegotten German machine gun could not stop it repeatedly spraying bullets through our non-existent window. They buried themselves in the plaster wall in a line about two feet above our heads. Not dangerous, just horribly annoying. (1) On July 10 the Kensingtons returned to the trenches at Hébuterne where they remained until the 17th when the Rangers relieved them and they pulled back to Sailly-au-Bois, 3.4 kilometres west of Hébuterne. I think “just behind the trenches” must refer to Hébuterne itself, probably in that 10th-17th period, as the “reserve” trench ran along the edge of the village. ‘Time passed and still no leave came my way. Chatting about this one day – grumbling to a comparative stranger – I got a hint about trying a different approach. At first, it appeared ridiculous. The chap said he knew a man badly in need of a break who, in desperation, got his father to write to Lloyd George about it. Soon afterwards he was granted seven days leave. So, in my next letter to my father, although fully aware that the officer acting as censor would read it, I stressed that I had been so badly treated that I would be grateful if he would write to the Rt. Hon. David Lloyd George stating that I had not been allowed to visit my home since Christmas, 1914(2), that I had served in Gallipoli and Egypt and now in the trenches in France – when still actually below the age at which one was allowed to be on active service. That last item I expected to be noticed, because around that time the authorities responsible for calling up men for military service had discovered a gap in the supply of recruits. Thousands of youngsters to whom papers had been sent on reaching 18 did not reply or report for duty. This led to the discovery that these chaps had enlisted, under age, at the beginning of the war; it was decided to bring them back, wherever possible, and restore them to their proper position in the stream. Many were, of course, long since dead and buried, like young Nibs, previously mentioned, at Suvla Bay. (2) David Lloyd George: Liberal Secretary Of State For War June 9-December 5, 1916; took over from Herbert Asquith as Prime Minister, December 7, 1916 to October 22, 1922. My father here forgot about a brief home leave granted his original Battalion, the 2/1st Royal Fusiliers, in late January just before they sailed for Malta on February 1, 1915. (3) For example, the Kensingtons’ War Diary notes the troops getting baths on July 7-8, then July 29 at Bayencourt, 5.8 kilometres west of Hébuterne. ‘Still, in the forward area, we continued to “do our bit”, not taking part in any notable action, but holding bits of the Front(4) in what usually seemed to us to be quiet spots. There was the time when a Minen from one of those bloody Werfers burst close behind me. The shock shattered me temporarily. I wore the chinstrap of my steel helmet fairly tight, yet the blast – from below it seemed – lifted the heavy headgear off and dumped it several yards away. Eventually I appeared none the worse. (4) The Kensingtons remained around the Hébuterne/Gommecourt section of the Front, and in the trenches most of the time, until August 21. ‘…there I was, outside the station, suddenly feeling strange and rather soiled among the hurrying people, all of whom looked clean and well-dressed. I saw a bus which would take me almost the whole way home, but hesitated to board it, having no money. I walked to the front of the bus to check the destination board, saw the driver already in his seat, stopped and told him I’d just come on leave from the trenches and had no money for my fare. “How far are you going?” “All the way when I get some cash.” “Then here’s your fare, son.” He handed me money from his own pocket. The kind man would not tell me how to get in touch with him to repay the debt and seemed very pleased to have been of use to a lad home from the Front. But I soon discovered I need not have bothered the driver, for the conductor asked, as I handed him the exact fare, “Is that alright?” – which among us, the hoi polloi, meant will you be OK if you part with this lolly? So I told him where I’d got the money and we both had a good laugh. ‘… the bus reached its turning point outside a big pub about half a mile from my home… and finally the walk down our street to knock on the door of Number 26. Ma opened the door and, at first, she was unable to grasp the fact that I was her son… but soon she hugged me in welcome and in I went. We sat facing each other, using time, of which we had plenty, to adjust to the situation. I’d known that I would be there. She had known, or thought she had, that I was somewhere in France. Now she must really believe her eyes. I’d changed in appearance, more than I was aware. She spoke of this – not quite the baby-faced lad who’d slipped away so long ago, as it seemed to both of us. By the evening, the family gathering was complete, Ted excepted [he was still at the Front] – my younger brother home from school, elder sister and my father back from work, and all of them so surprised by my sudden appearance among them. I had at least as many questions to ask them as they had for me, and it was pleasant to be talked to as an adult, whereas beforehand I had not quite rated that status with brother Ted the first son – I had never seriously questioned the situation because of his obvious superior intelligence and better judgement. Rather, I had felt proud of him. But I had lived through strange events and borne some small but serious responsibilities since last we were all together, and perhaps it showed. Or they may just have been naturally glad to have me there with them for a while… Either way, happiness; nor could I have wished for a more affectionate welcome. With less cordial relationships, I could have found difficulty in admitting that my clothing housed other creatures than myself, but fortunately tales of the crummy state of men at the front had become common knowledge and, after chatting about the lousy conditions under which we often lived on active service, Ma suggested that I strip, have a bath and dump all my clothing out back. ‘… the shock that shook really hit me when Pa almost casually told me that, as I’d requested, he did write to Lloyd George about my having been denied leave after reaching France from the Mediterranean, and how unfortunate he thought that was, particularly because, having served well enough to be promoted to the rank of Corporal, I was still below the permitted age for young men to go on active service. He had received an acknowledgment and an assurance that the matter would receive consideration. So that explained the Special Pass originally made out to another man, but hurriedly handed to me. What a rocket some big fellow must have received from the office of the fiery and very powerful LG! (6) Not “Downing Street” in fact: Lloyd George served as PM for many years, but didn’t move over from War Minister until December, 1916. ‘Suddenly, on that dark moonless night, criss-crossing searchlights illuminated the whole sky, wide beams terminating in big, circular blobs of light where they encountered clouds. This unwelcome display of London’s air-raid defences coming into action brought my thoughts back to reality with a jerk. No enemy planes appeared and no anti-aircraft guns fired, but my feeling of security, one of the boons of this holiday, now vanished. No place, after all, completely without risk of enemy attack in some form. ‘…the final kilometres I had to manage on foot. But this provided me with a most warming experience as I strolled into the town. Our lads, who had themselves arrived only a few hours earlier(7), were billeted in dwellings and outbuildings at various points along the main street. Groups of them lay about on the wide grass verges on either side of the roadway and, at intervals as I walked, fellows who knew me invited me to join them and each in turn insisted I took a swig from their water bottles – all charged with the same liquor, to wit, cider. I was greatly surprised, first, that so many people knew me and, second, that they should offer me a drink. Their kindness warmed and enlivened me just as much as the rather strong cider. … my progress along the road had something of a triumphal air about it. A wave here, called to join a group there, swigs from bottles well filled with the local cider; all this camaraderie took the edge off the regret I felt about leaving family and friends to return to a life I had come to dislike, deep down inside. (7) From the Kensingtons War Diary I deduce this must have been Millencourt-en-Ponthieu, near St Riquier, 63 kilometres west of Hébuterne, in the Picardy region and that my father arrived only a few hours after the rest of the Battalion, which would make the date August 23. ‘Probably because of my youth, I wore my modest rank lightly and still relished the comfort given by the comradeship of the men around me. I do believe I would have been hurt more by an accusation that I was too strict than that I was behaving in too easy a manner. With some such understanding between us, I always found the essential needs of discipline easily procured or, rather, willingly granted by our men. ‘In the next section of the front line we manned(8), no satisfactory or permanent settlement had been achieved following the recent battle. Away to our right we could see what we considered to be our front lines – occupied by Germans. Meanwhile, we had annexed the former German reserve trench, as we would have termed it; the part we held contained a number of large, deep dugouts – our chaps must have had a tricky job clearing the Jerries out of that network. Way ahead of this strong line lay shallower temporary trenches of the kind I’d often been involved in digging overnight in No Man’s Land. Of course, we now had the use of everything the Germans had established – an unaccustomed situation. But we soon took pleasure in being able to have a few hours uninterrupted sleep down there in the underground shelters which, on average days or nights, greatly muffled the sound of exploding shells. One had the feeling that the world of violence up above was distant, really remote. Reflecting that, in many parts of the Front, the Germans had the advantage of this sort of facility, one wondered if we could ever effect a real break through the enemy lines. (8) Now “lent” to the 15th Brigade, the Kensingtons moved into the trenches near a village called Maricourt and an area known as Leuze Wood, held by the German Army. They fought in the vicinity of Combles and alongside French troops throughout September, including some involvement in what became known as the Battle Of Morval, September 25-28 (5,000 Allied casualties). So you may be able to appreciate my feelings when, next time out at rest, I was ordered to report to the Regimental Sergeant Major, the big man I’ve told you about, splendid soldier, he who ordered me to put up a second stripe when I didn’t want to. I entered the room in a half-ruined house he used as an office, stood smartly to attention, announced my name and rank, and he told me to relax. 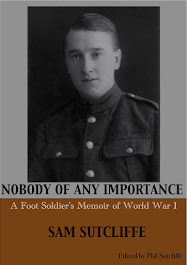 He chatted in a very friendly way – it really did amaze me that the top man of all the NCOs should have any knowledge of me, trying as I always did to play it quietly, lie low and bother nobody. I had to think very quickly. Then I recalled my letter home during the period when I was feeling, not desperate, but quite bitter about not getting a few days leave, and how my father had relayed that appeal, as his own, to Lloyd George. I realised then that this thing had not stopped with me being given special leave. The rest of it had gone through too and I was to be sent back. (9) My father was 18 on July 6, 1916; conscription of males aged 19 upwards began in January, 1916, and, although the lower limit was further dropped to 18 that May, according to http://www.1914-1918.net/recruitment.htm the law still said a soldier could not be sent into battle overseas until he was 19. (10) Unsurprisingly, the Kensingtons’ War Diary makes no mention of my father’s departure and clues to the date are sparse but, given that his sabbatical from the front line came through just before that “big battle pending” he mentions a few paragraphs earlier, I think it would have been late September/the start of October. Because from October 5-9, on the stretch of Front they’d occupied for more than a month, the Battalion took part in an ill-fated action around Billon Farm and then Trônes Wood, their casualties totalling four officers and 179 ORs. (11) Harfleur: a small port on the banks of the Rivers Seine and Lézarde – back then, three miles from Le Havre, now a suburb; also the scene, you’ll recall, of the 1415 Anglo-French battle which inspired the “Once more unto the breach, dear friends…” speech in Shakespeare’s Henry V.
And so my father got a year out from the stinking war which had so got up his nose. Naturally, he felt guilty about accepting what he was legally entitled to, but he did fancy living – and as the next 14 months proved, his young body needed a break: transferred to Harrogate (and oddly, at the same time, to the 2/7th Battalion Essex Regiment), he spent two to three months of this period in hospital for various ailments no doubt caused or exacerbated by the debilitating front-line conditions in Gallipoli and on the Somme. Much fitter and 19 to boot, he returned to the Front from December 1917, fought his last battle in the defence against the German Spring Offfensive of 1918, and then suffered terrible deprivations as a POW until Armistice started his long walk back to France. Those, to say the least, interesting events are covered in his full Memoir and also in the new e-book episode A Foot Soldier’s War – The Survivor, available via this page. 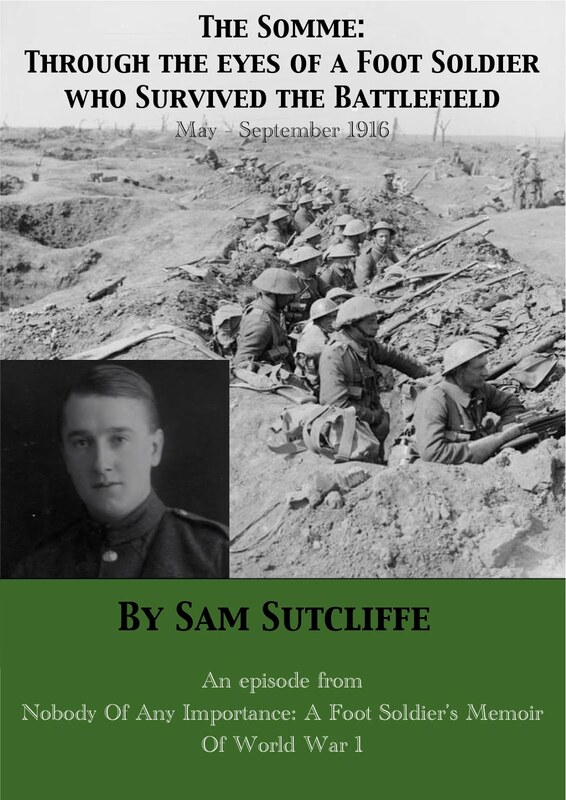 Next week: Back to the 100-years-ago-this-week continuing story – November, 1917, the powers that be notice Sam’s of age to fight and decide his Signalling needs brushing up so it’s back to school… with instructors and fellow “students” who’ve never been anywhere near a trench. A hundred years ago this week… The infamous 2nd Battle Of Passchendaele began (October 26-November 10), the climax of the Ypres campaign launched on July 31. Presaged by a British attack around Poelcapelle (22; 13 kilometres northeast of Ypres), the three-phase Allied onslaught started with Canadian forces at the centre of British and Australian support making gains behind a creeping barrage of artillery. Most of their objectives had been reached by the time they took a planned pause (28), but the Allies had suffered more than 15,000 casualties already. Partly by way of diversion, with Pétain acting in accordance with Haig’s repeated requests, the French instigated the Battle Of Malmaison (October 23-November 1; in the River Aisne region near Soissons), following a six-day artillery bombardment, including gas shells, with a brisk six-kilometre advance which took control of the Chemin Des Dames ridge and pressed on (25-7) to capture Pinon and Filain villages. Down in southern Austria/northern Italy, the 12th Battle Of The Isonzo (October 24-November 19) – also known as the Battle Of Caporetto – looked like becoming the most decisive of the dozen when combined Austrian and German forces drove forward 25 kilometres on the first day, using storm troopers and gas (chlorine and phosgene). They broke the Italian lines at Caporetto, Tolmino and Piezzo and soon (26) the Italians evacuated the Bainsizza Plateau so hard won in the previous edition of the Isonzo battles. The central Powers promptly retook Gorizia (on the current Italy/Slovenia border) and, moving further west, Udine (both 28). Meanwhile, the British Army gave advance notice of its imminent interest in another go at Gaza by raiding Outpost Hill on the edge of the city (October 26). Last week, my father, just promoted Corporal Sam Sutcliffe, and his new Battalion, the Kensingtons remained (often hair-raisingly) involved in the Somme Front fighting through May and into June, 1916, which preceded the notorious July 1 when the Battle Of The Somme is deemed to have begun. 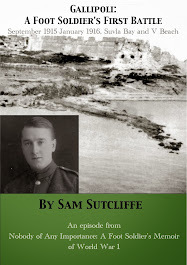 Gallipoli veteran Sam, lately and lamentably deprived of the 2/1st Royal Fusiliers’ bonded comradeship when the Army disbanded that battered Battalion rather than rebuilding it, became ever more impressed with the industrial efficiency of the Western Front war – after the harumscarum experience of the peninsula. Yet his darker side wondered whether the adversaries in France had constructed a war that would never end. His new normality included regular night-time forays into No Man’s Land and, to his surprise, quaffing cheap champagne with the NCOs at their just-behind-the-lines base in Souastre (they did most of their frontline fighting at Hébuterne, opposite German-held Gommecourt, on the north end of the Somme Front). A good crowd, apart from a Sergeant who, in the frontline, cracked up and dug a hidey-hole in the side of a trench before being “sent away”. But that got Sam reflecting ever more on the mental pressures of the battlefield. ‘… [but] occasionally, a man did just that and, if charged, would be court-martialed for showing “cowardice in the face of the enemy”. Around that time, I had the unpleasant duty of being Corporal-In-Charge of a small party of men assembled to march a prisoner from the hut in which he was confined to a court martial held in a farmhouse. Having rehearsed our part in advance, we marched the poor devil in, heard the prosecution and defence, marched him out while the court deliberated, took him in to hear that he had been found guilty, the sentence to be announced in due course, and marched him out. I assumed he would be shot – because at that time it was customary to pass from hand to hand along the front line occasional notices from Army HQ listing courts martial and their findings. So you could read that “Private So-and-So was charged with showing cowardice in the face of the enemy and sentenced to death by firing squad. The sentence was duly carried out.” Those, roughly, were the words used. The list of cases would conclude with a warning to all about behaviour and discipline. Cheerful reading for men already coping with hardships and risks – often terrible trials of self-control. These things, so very far removed from the cheerful volunteer spirit of 1914, made those early days seem like a chapter from a different war altogether. Now it was every man for himself and if Jerry doesn’t get you, General Haig’s red tabs(1) will. As we often said, it was all right for those bastards at Army HQ about 50 miles back. With their maps, plans, and schemes, battle was probably no more than a game to them, to be played between 10-course meals. (1) “Red tabs”: staff officers identified by red tabs on their tunic collars, based at British Army HQ – Field Marshall Haig himself occupying the Château de Beaurepaire, Montreuil-sur-Mer, Pas-de-Calais department, about 60 miles from the Somme Front, March/April, 1916-April, 1919. ‘So they didn’t shoot him after all. But why not? When ordered to go over the top and charge, he’d run in the wrong direction and got several kilometres rearwards before they arrested him. Perhaps courts martial did not always send men found guilty to the firing squad and the execution lists we saw on the front line were adapted to scare potential deserters? ‘After a spell in that village, which appeared almost remote from the perils of war although within marching distance of the Front, we were once again to return to the trenches. Information circulated one afternoon, roughly 24 hours before we must depart(2). We had been training for a few hours each day but, on our last day in this comparative little heaven, we were freed of all duties except really necessary chores. I strolled around the village noting the utter ruin of some houses and marveling at others’ apparent immunity from damage. The place was in a valley, fairly shallow, but the ridge on the western side shielded it from direct enemy observation, so only the odd plane would see anything worth reporting. Up to that time, at any rate, it had provided a very fortunate spot for troops who rested there, savouring something of its peacefulness. As evening approached, I felt the sadness of leaving this unexpectedly cosy haven. A final sleep on the comfortable wire netting [bed], the packing up of all our bare requirements for survival up front, and our trek westward began. In the last three or four kilometres we slowed, for then we moved in darkness, in two files, while giving complete attention to maintaining contact with one another. The mere thought of wandering alone in that black gloom with no road or track visible, no buildings, great holes here and there usually containing a foot or two of water into which one might topple… these things kept one keenly alert, as did the knowledge that, in this new era of the conscripted soldier, trust and faith in the good intentions of one’s comrades was dead or dying, and a man wandering away from his unit, no matter under what conditions, would attract suspicions of trying to “dodge the column”. We found the section of trenches we took over in fine condition. The Engineers had installed their “revetting with expanded metal” system quite splendidly, as well as a sump under the duckboard floor of the front trench, perfect drainage, and so superior to the old, sloppy, mud floor on which we had often slithered. The Regiment had formed a machine-gun unit by combining all the Battalions’ heavy machine guns and their gunners under the control of a separate authority at, I understood, Brigade level. They had become a force to be reckoned with by the enemy. Well behind our machine guns lay numerous batteries of field guns which fired 18-pound shells, and still further back the heavy howitzers whose shells tore great strips out of the atmosphere as they roared towards targets in Jerry rear positions – borrowed from the Navy, some of these big guns, to back up what was going to be a massive British attack. Above us, at most hours of the day, droned one or two planes. They patrolled the length of the line, each doing a stint of observation. If our plane altered course towards Jerry’s line, perhaps to take a closer look at something of interest, pops and white blobs of smoke up there in the sky around it would indicate enemy resentment. Occasionally a group of ten or more of ours, flying really high, would head towards some enemy target way back, forging ahead despite all anti-aircraft fire. Only if the Jerries sent up deterrent planes would real action occur, and then the aerobatics claimed every man’s attention. We felt great sorrow if we saw one of ours hit and descending, but cheers would ring out if one of ours shot down one of theirs. Rolling, zooming, looping – every tactic was employed and appreciated by the onlookers. Our pilots sometimes used the “falling leaf“ ploy to deceive an enemy into thinking they were beaten, then a sudden recovery and upward zoom might result in a volley from below wrecking the Jerry plane. If one of our flyers had been ordered to take a look at some development, he would make constant attempts to get the photographs he needed. I saw one such who dived repeatedly despite becoming a target for all the machine guns in the vicinity – he was flying too low for the ack-ack guns’ angle. Eventually he started to wobble, but just managed to stay airborne and pass over our heads. He bumped down a few hundred yards behind us, some men climbed out of a trench near him and, while they struggled to free him and carry him off, German artillery found the range – our men barely got back under cover before a shell wrecked the plane. Later we learned that a bullet had penetrated the floor of the plane and passed through the pilot’s thigh. He lived, and that knowledge gladdened us after witnessing his display of determination. (2) The British Army’s Somme attack had long been planned for June 29. The order to postpone until July 1 came through on June 27. The Kensingtons, ready to move out on the 28th, remained in Souastre for another 48 hours until 8.25pm on Friday, June 30. My father’s description of the dogfights and the German observer planes must come from his memories of the whole build-up period rather than that last 24 hours before the attack. During this postponement, one extraordinary thing happened to the Kensingtons; the Brigade command replaced their Commanding Officer! On the 27th, says the WD, “Major HWH Young of (7th Batt.) Leicestershire regiment arrived with his batman”. The following day, “Temp. Lt Col WHW Young” (I don’t know whether the change of rank was the diarist’s mistake or an overnight promotion) took over as CO from Lieutenant Colonel HJ Stafford who promptly “proceeded on leave to England”. Young’s notes, attached to the Kensingtons’ WD by the National Archive, say he was rushed in by car from Étaples on the 27th – to Stafford’s astonishment. So Young went to Brigade HQ to seek an explanation. He was told the Battalion, being City boys, were “not good at digging”. Perhaps seeking a clue as to how a change of CO might effect an improvement in this area by July 1, he asked about Stafford; the Brigadier said he “knew very little” of the ousted CO – who’d led the Battalion for five months. Young writes that he found this “an extraordinary statement”. Still, of course, he had to then try to get to know his officers at least, given they’d all convene on the battlefield within two days. Whether my father forgot this change at the top or the Battalion simply wasn’t informed about it I don’t know. Now comes my father’s account of July 1. I’ve just let it run, leaving the lengthy, explanatory footnotes to the end for those who care to look at the wider picture too. ‘On the day – which followed a period of massive bombardment of enemy positions to destroy their barbed wire defences etc – our Battalion was to occupy the ordinary front line, and our most advanced trenches where my Platoon found itself. The support trenches behind us sheltered a kilted Regiment who would come through our line to start the infantry attack, at which our men in the front trench would advance over the German front trench – by then in the hands of the Jocks – and go on to take the German support trenches. Finally, from the advance trenches, we would pass over all those people and clean up and occupy the German rear positions. Meanwhile, enemy machine guns massed at strategic points and they stood their field artillery almost wheel to wheel, or so it seemed, and the whole area became an inferno of explosions and bullets. When the kilted lads advanced, their numbers decreased alarmingly with every forward stride. Meanwhile, our own advanced position was being blown apart piecemeal; pockets of survivors lost touch with their leadership and the nearest NCO had to make decisions… If he could only see ahead that our first line of attack was destroyed before capturing its objective, that its members lay dead and wounded on the ground ahead or grotesquely draped over the enemy barbed wire which our bombardment should have destroyed, then when should he take his small force over the top? Some small groups did from time to time go ahead until killed, wounded and captured. Some dedicated officers achieved marvels within limits set by the powerful enemy, but in the end this massively prepared attack failed. Nothing was gained in our sector. Many good men were lost. Many normally strong fellows were reduced to trembling, inarticulate old-looking men. Our beautiful front line had become an uneven shallow ditch for most of its length, the expanded metal revetments either lost under piles of blasted earth or just sunk deep down in shell holes. The wounded men who could not walk or crawl back from No Man’s Land were, in many instances, simply left there for hours following the failed attack because of the mentally and physically exhausted condition of their comrades who had survived. I saw a Scot who, though not wounded, just sat and shook. His head nodded, his arms flailed feebly, his legs sort of throbbed, his eyes obviously saw nothing. One of our usually most happy and physically strong men was crying non-stop while violently protesting about something. He’d been buried up to his shoulders in earth and, even in that inferno, men nearby had paused in their advance to free him, yet he had this strange grievance. So, possibly, nervous shock afflicted everyone there to a greater or lesser degree, even though fear no longer weighed on us as earlier in the day. During the hours of darkness, we began to receive assistance from the rear – food and the occasional tot of rum, anything which could be transported forward in the awful conditions prevailing. A gradual return to usefulness replaced the varying degrees of stupor and inertia which for many were the invisible wounds following many hours of explosion and upheaval, shattering to eardrums and nerves… and ruinous to pre-conceived ideas of what should be occurring according to plans worked out in grandiose HQ châteaux many kilometres away in the rear. Meanwhile, the work of holding positions with a proportion of survivors, and allowing small parties to search for and bring in wounded men was organised by the remaining officers and the unshakeable RSM, who won praises from everyone who chanced to be near him during the battle(4). Our Company – such as it was now, after its brush with hell — remained in what had been the front line. By dawn, most of us were ready to stop where we stood – crouched, rather – for under cover of dark we had searched for and found many wounded men, their chances of living diminishing with every hour in which they lay exposed with wounds untended. We felt that our work was very valuable and the joy with which injured men greeted their rescuers was reward indeed. Perhaps the failure of the massive attack had left us with a sense of guilt which the intensive rescue work relieved. So urgent was the need for rapid recovery of the wounded, that RAMC men from hospitals and dressing stations moved forward at night, having volunteered to join the search in No Man’s Land. They gave initial treatment and care during rapid removal to the appropriate medical centre further back. All this, of course, they carried out under risk from enemy guns, a new situation for hospital workers who would only have heard the odd long-range shell or a few rare bombs from aircraft explode. So shells bursting around them while they worked did cause them some excitement. They saved many lives. In the front line – the model for all front lines until it went up in dust and smoke – our Company had some sort of cover still, but only in places, and much work would have to be done to make it suitable for occupation. That job wasn’t ours, so we kept watch and rested through the day after the battle, in usable sections of the trench or in large holes. We were given two or three days rest a couple of kilometres back(5) and then returned to continue clearing up the mess – the first few nights devoted to recovering our dead mates, the living wounded having by then all been rescued. The identity discs we wore now became very important; each dead man having this link with the living could be identified and his death notified and a train of events set in motion to inform his family, finalise his service record, accord him a proper burial in a known cemetery, and finally secure for his nearest relative some sort of pension. The real difficulty was in regard to those so badly mutilated no way of identifying them existed. As soon as possible, I guided two of the men doing recovery work to Charlie. I recalled then, as I do now, his special qualities. He was completely honest, stubborn about things in dispute, but usually found to be right about them in the end; Cockney in speech to an extent which, on first acquaintance led one to expect illiteracy, he soon made you realise your error — he handled sending and receiving Morse Code messages better than most. In fact, before the war he’d done that kind of work on the railways, but using a machine which emitted two musical sounds, high and low, instead of dots and dashes. (3) Something odd struck me, as maybe it strikes you, about my father’s account of July 1, 1916, the first day of the Battle Of The Somme; it’s as if he’s not a participant, but a remote observer. This is very different to the way he writes about other battlefields – in Gallipoli earlier, and subsequent experiences on the Western Front, including his front-line account of fighting against the German Spring Offensive around Arras in March, 1918. When he wrote his story, back in the 1970s, and I first read it, section by section, at his request querying anything I didn’t understand, one of my questions – I still have the handwritten sheets – was “[Writing about the Somme] you cover the general situation but, for once, don’t say what was happening to you – were you in the… advanced trench throughout and therefore a ‘spectator’?… you get personal again in the aftermath, recovering bodies etc, but there is this notable blank on what you were doing at the peak of the action…” He didn’t answer that question; but then he didn’t answer any of the other far more banal questions on that sheet either and I simply don’t know why not. So my speculation runs from “he just didn’t see that sheet of questions for some reason, to the events of that day so shook him that his usual total-recall memory registered very little bar broken fragments”, to “he did remember but it was so terrible he couldn’t bring himself to write down much of it”, to “he felt guilty that he could do nothing/did nothing to help his comrades”. His A Company, marching Platoon by Platoon at two-minute intervals to minimise shell casualties, led the Battalion from Souastre via the Brigade “equipping dump” at Bayencourt (three kilometres due south, where they gathered ammunition, grenades and picks) to Hébuterne where they arrived at 12.05am on July 1. His Company moved into front-line trenches designated W47 and W47S facing Gommecourt. The 1/14th London Scottish (my father’s “kilted lads”) had reached their positions to the Kensingtons’ left at 11pm, June 30. At 2.45pm the German artillery began a massive bombardment, wrecking trenches and killing men, to which the British did not respond until the pre-planned time, 6.25am. An hour later, says the WD, “our smoke started” ­– cover for an infantry advance – and the German barrage resumed maximum intensity. The London Scottish charged out into this maelstrom on schedule at 7.50am. Company A were supposed to follow up soon after with digging parties to construct a new trench through No Man’s Land to the supposedly captured German front line – which the Scots had actually achieved, at terrible cost. But the Kensingtons’ new CO, Colonel Young, asked Brigade’s permission to hold his men back because the German artillery made static work in No Man’s Land suicidally impossible –Brigade agreed, so my father and his comrades remained in their crumbling trench. However, at 9am an A Company Platoon (not my father’s, I gather) did attempt a race through the smoke, shells and machine-gun fire to resupply the London Scottish with ammunition and grenades (“bombs” the infantry called them back then). The WD says they “disappeared” – not quite as stark as it seems, meaning they couldn’t get any message back rather than that they had all died. By 11.30am A Company was still sending parties across no Man’s Land with supplies for the London Scottish; it would take an hour to cover the 400 metres separating the lines, with heavy casualties suffered (I don’t know whether my father was one of the few men sent out in this way who actually made the return journey too; quite probably not, given the sense of grievous impotence his few words carry). At 1.35pm, Dickens sent another messenger back to HQ reporting he had about 50 men of A and C Companies in trenches W47 and W47S (including my father still). Colonel Young sent what he had left, as recorded in his own notes: “party of Signallers, servants and minor shell-shock cases collected and sent with Capt Harris” (Harris and his men didn’t connect with Dickens, but did end up in another part of the front line and assist in its defence). At 3pm, another runner conveyed Dickens’s final message, quoted by MacDonald: “I have, as far as I can find, only 13 left beside myself. Trenches unrecognisable. Quite impossible to hold. Bombardment fearful for last two hours. I am the only officer left. Please send instructions.” The instruction was to withdraw and his group (by then probably not including my father who, I deduce, remained in the front line; see below) reached HQ in the reserve line 45 minutes later. (4) Most of the remnants of the Kensingtons had straggled back to Hébuterne on the evening of July 1, and then, says the WD, around 9pm, the 1/8th Middlesex relieved them in the W Sector trenches, whereupon they “walked” (not marched) back to Sailly-au-Bois (3.4 kilometres west of Hébuterne) where they had to spend the night… in another trench. But my father clearly describes how, along with some others from A Company, he spent the first night after the catastrophe, and most of the day too, on the battlefield and, chiefly, in No Man’s Land before catching up with the Battalion. Well, not hard to imagine that in this particular “fog of war” the survivors pretty much made it up as they went along – and they obviously wanted to do something useful, even make amends, having been able to do little more than survive the day through sheer luck while many of their comrades fell wounded or dead. The Kensingtons’ WD states that 24 officers and 525 ORs (Other Ranks) who went into battle and the casualty count (dead and wounded) was 17 officers and 310 OR (59% casualty rate). Pro Patria Mori adds that the London Scottish casualties numbered 14 officers, 575 ORs and 15 Medics (77%), the neighbouring Rangers (1/12th London) 17 officers, 447 ORs (58%), and 1/4th City Of Londons (Royal Fusiliers) 16 officers, 344 ORs (58%). Incidentally, it’s a shame my father never named “the unshakeable RSM” – I can’t find any reference to him in the WD or Pro Patria Mori. (5) On July 2 the Kensingtons moved back from Sailly to tents then billets in Souastre. Possibly they conducted their nightly searches for the dead – including Sam’s friend Charlie – in front of Foncquevillers (“Funky Villas”, 5.3 kilometres west of Souastre, 2.9 kilometres north of Hébuterne). My father was 18 on July 6, 1916 – probably around the day he found Charlie. In the Memoir he makes no mention of his birthday.